The cult film director Jean-Luc Godard, classic maker of poignant social cinema Ken Loach, French Culture Minister Francoise Nyssen as well as other artists and cultural figures sent an open letter calling for the release of Oleh Sentsov and international mobilization in order to accelerate this process, reports the Ukrinform news agency. The letter was published by the French newspaper Le Monde recently. “Since art recognizes no borders, because it is universal, the rights of those who create it should be just as limitless. The freedom of speech and the freedom of creativity should not stop where dissent begins. Still, a director is dying as we speak because he is a dissident. His life is in danger because of his ideas, just like it was with Vasily Grossman, Alexander Solzhenitsyn and others under the communist regime,” the letter is quoted on the Ukrinform website. 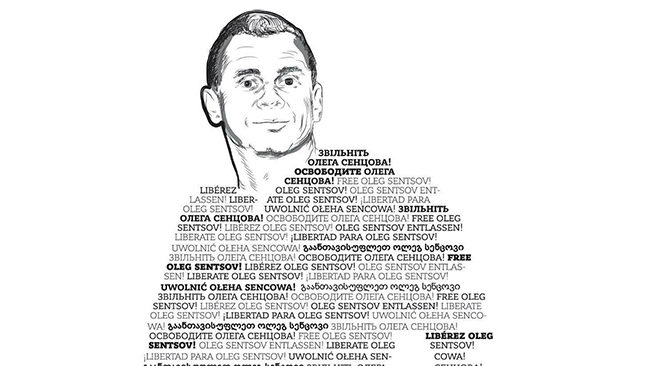 “Not to act is to let Oleh Sentsov die. It means abandoning our values and our principles, abandoning what we stand for and what we are. It means agreeing with the claim that people may be killed over their ideas, thoughts, positions,” the signatories emphasize. Ukrainian artists keep supporting Sentsov as well. For example, the Dukat Gallery of Kyiv hosted the art event “Freedom or Death,” created jointly with the creative association Babylon’13. It exhibited posters, installations, and videos devoted to the “prisoner of the Kremlin.” Matvii Vaisberg, Kseniia Hnylytska, and Andrii Yermolenko were among authors of these works. Everyone can make a small and somewhat artistic gesture in support of Sentsov. An open-ended flashmob called #FREESENTSOV! #YOUCANDOIT has started recently outside the embassies of the G7 countries. As reported on the event’s Facebook page (https://www.facebook.com/groups/251125322385673/about/), its purpose is to put pressure on influential countries to make them impose tougher sanctions on the Russian Federation. “Approach the embassy of one of the G7 countries (the G7 countries include Canada, France, Germany, Italy, Japan, Britain, the US, and the EU) or other influential country. Take a picture of yourself holding a poster reading ‘Free Sentsov’ with the embassy in the background. Tag the embassy in the photo. Spread the photo over social networks with tags #FreeSentsov #YouCanDoIt. Also, invite to the event friends in Ukraine and abroad, let them join the effort where they can. Then e-mail the photo to the embassy, asking the official representatives of that country to help us get the political prisoner Oleh Sentsov released,” they describe the action plan on the social network. One can download posters and find addresses of Kyiv-based embassies on the Facebook page. The initiative has no specific organizer and is run in a spontaneous manner.